Although the signs welcoming visitors to Clarkston say it was founded in 1832, the first land purchases were made nearly a decade earlier, in 1823, by the Williams family of Waterford Township. By 1831, early inhabitants like Linus Jacox, Butler Holcomb, John and Thomas Beardslee and Melvin Door established homesteads, and it was not long before more settlers from New York and New Jersey arrived. They included Jeremiah Clark in 1832, followed by his brother, Nelson, who built his home in 1839 in what would become the Village of Clarkston. It still stands at 71 N. Main Street. The Clarks were extremely involved in their newly adopted hometown. They built a sawmill and gristmill, started a fish hatchery, opened a general store and served as postmasters. They also were active in local politics; Jeremiah, for example, was township supervisor and justice of the peace. In 1840 they platted the village and two years later, in 1842, grateful settlers voted to name the village Clarkston. By 1877, the Clarkston area grew to include nearly 1,400 residents as well as thriving farms and businesses. The village was home to several stores, including furniture, clothing and jewelry shops, as well as hotels, wagon makers, harness makers, liveries and – to keep the growing population healthy – three physicians. Schools and churches sprang up, too. Sashabaw School was built in 1834 at the corner of Maybee and Pine Knob roads, and its earliest students included children from the Beardslee and Riker families. Nelson Clark built the UnionSchool in 1840 in the center of the village; it was operated as a private academy until 1862, when it was sold and turned into a public school. In 1910, the original frame structure was replaced by a new high school, which decades later would house an upholstery factory for Ford Motor Company before being converted into Independence Township Hall. Today it’s back in private hands. Clarkston’s spiritual needs were, at first, handled by Methodist missionaries from Detroit and Saginaw who conducted services in schools, homes or barns. Clarkston’s first church – the Methodist Episcopal Church on Buffalo Street, was completed in 1847 and replaced by a brick and stone structure in 1873 that today is a private residence. At the same time, the First Baptist Church was erected on Main Street and now – as a testament to Clarkston’s will to embrace historic structures – houses a nationally known restaurant. Once the railroad was established in 1851, tourists from Detroit and Pontiac discovered Clarkston’s charming lakes, farms and woodlands. It wasn’t long before hotels like the Demarest House, Vliets-On-The-Hill and Deer Lake Inn were built to accommodate the influx of summer visitors, and a new opera house on the top floor of the downtown Maccabees Building kept them entertained. Local beaches provided relief in those days before air conditioning, despite a law warning bathers to wear long coats and keep legs covered or face a $100 fine. The Clarkston Band strolled the village streets on summer evenings. The transformation of Clarkston was complete with the invention of the automobile. Roads that were once Native American trails were paved and widened for this new mode of transportation. The Saginaw Trail, now known as Dixie Highway, was paved as early as 1920, and Main Street (M-15) was paved around 1922. The expanding national highway system spearheaded by President Dwight D. Eisenhower brought I-75 through the Clarkston area in 1962, spurring both business and residential development. It was the most radical change to face Clarkston yet. Many farms gave way to subdivisions and strip malls as the Clarkston area continued evolving into a northern Detroit suburb. Today the area, like many formerly rural townships, continues the challenging task of balancing the needs of a modern society with preservation. In the 1970s a group of concerned citizens worked to add Clarkston to the National Register of Historic Places. 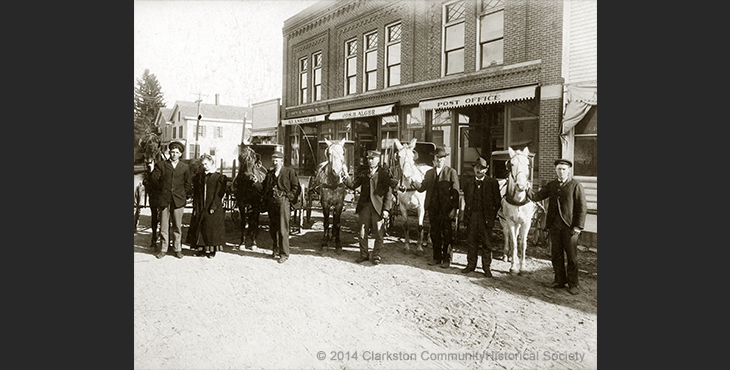 These citizens were the founding members of the Clarkston Community Historical Society. Becoming a National Historic District ensured the protection of Clarkston’s surviving historic structures, preserving the charm, character and serene lifestyle that appealed to its very first residents. With careful planning and cooperation, Clarkston’s rich history will be cherished for generations to come.